To skip straight to sample code for containers, see here (MBE30, MBE31). 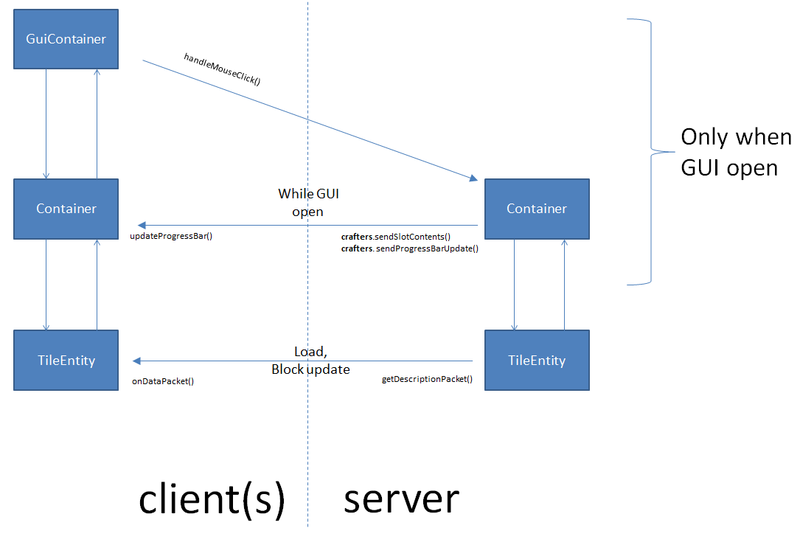 The data about the container is stored in the TileEntity for that block. Typical examples of the data are -what items are in the container, furnace fuel burning time & smelting time. The "master copy" of the TileEntity data is always on the server. During initial load, and when chunk data is updated/resent, the client copy is updated as for normal TileEntities (using NBT in getDescriptionPacket() and onDataPacket() - see here. a) GuiContainer, which specifies the layout of the GUI, retrieves items and other data (eg progress bars) for display, and interacts with the user. The basic element of the GuiContainer is a number of "Slots" where items can be placed. b) Container, which collates the information from various sources into a single instance that the GUIContainer can use. For example, the ContainerFurnace collates information from the TileEntityFurnace and player inventory. It provides a consecutive list of Slots numbered from 0 .. N-1, where (eg) 0..35 might come from the player inventory, and 36 - 44 might come from the TileEntity. Simple information can be sent from the client container to the server container using the crafters member variable of the container - icrafting.sendProgressBarUpdate() and icrafting.updateProgressBar(). The Grey Ghost, please, write posts for modify player inventory (count slots) and use own gui of player inventory instead of default. I'm not sure what you're asking me to write about? Do you mean- replace the default player inventory GUI with a custom GUI? 2. And in some cases replace default player inventory logic and gui own inventory logic and gui. For example, player inventory worked as a ender chest. That is stored in the inventory really stored in the ender chest. Hi,your English is fine :) I understand you better now. You could probably better ask this question on the forge forum, lots of helpful folks there. 2) subscribe to the GuiOpenEvent, and when the vanilla GuiInventory gets opened, replace it with your custom inventory. TGG, please, add navigate panel to your blog (archive messages). Hi TGG, I have a problem with my custom furnace. When I try to open my custom furnace in a spectator mode. It throwing an error message like IndexArrayOutOfBound 32 or something. I copies furnace code from Minecraft. Why I getting this? Hi. I haven't tested with spectator mode, but perhaps the inventory size is different? Does it work with a normal player? You might try looking at this tutorial furnace which is easier to understand than the vanilla. https://github.com/TheGreyGhost/MinecraftByExample (see MBE31). Lots of helpful folks there.